The Kings today acquired forward Caleb Swanigan from the Portland Trail Blazers in exchange for forward Skal Labissiere, according to General Manager Vlade Divac. Additionally, the team has waived guard Ben McLemore III. In his second NBA season out of Purdue, Swanigan has posted 2.1 points, 2.4 rebounds and 7.4 minutes per game in 45 contests (three starts). Originally selected by Portland with the 26th overall pick in the 2017 NBA Draft, the Fort Wayne, Ind. native recorded his first career double-double with 10 points and 11 rebounds at Indiana (10/29/18). The former Indiana Mr. Basketball played two seasons for the Boilermakers, posting 14.4 points (.501 FG%, .376 3pt%, .760 FT%), 10.4 rebounds and 2.4 assists in 69 career games (all starts), earning consensus First Team All-American, Pete Newell Big Man of the Year and Big Ten Player of the Year honors in 2017 after finishing his sophomore campaign ranked second nationally in rebounding. Selected out of Kentucky with the 28th overall pick in the 2016 NBA Draft, Labissiere has recorded 8.7 points (.476 FG%, .356 3pt%, .766 FT%), 4.8 rebounds, 1.1 assists and 19.9 minutes per game in 93 contests (started 40). He notched a career-high 32 points to accompany 10 rebounds at Phoenix (3/15/07). Originally from Haiti, the 6-11 forward played one season at Kentucky (2015-16), registering 6.6 points, 3.1 rebounds, 1.6 blocks and 15.8 minutes per game in 36 contests (18 starts). 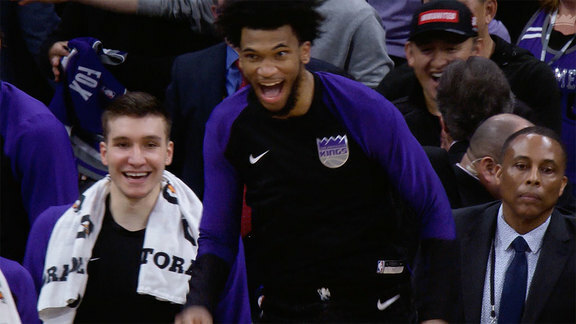 A six-year NBA veteran, McLemore III has posted 8.8 points (.417 FG%, .353 3pt%, .783 FT%), 2.5 rebounds, 1.1 assists and 23.7 minutes per game in 368 career contests (233 starts) with Sacramento (2013-14 – 2016-17, 2018-19) and the Memphis Grizzlies (2017-18). Selected seventh overall in the 2013 NBA Draft, the St. Louis, Missouri native represented Sacramento in the 2014 Slam Dunk Contest hosted in New Orleans. The 6-5 guard played one season of collegiate basketball at Kansas, earning 2013 consensus Second-Team All-American and First-Team All-Big 12 accolades as a freshman.